← Dessert of the day: do Ladurée macarons hit my sweet spot? I already wrote about Chanel’s Stylo Eyeshadows from their L’Ete Papillon de Chanel Summer 2013 Collection – but c’mon, do you really think the range could have passed me by without picking up a polish or two?! 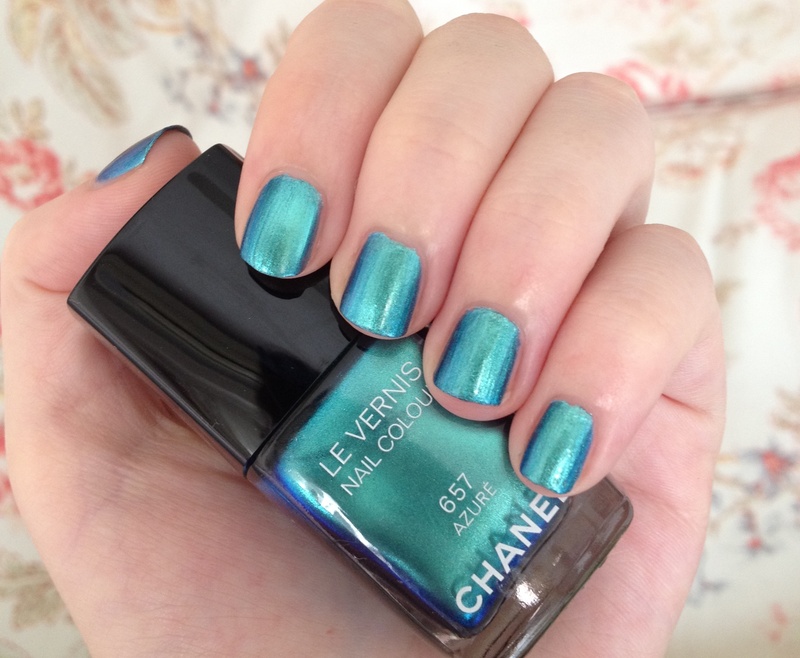 First on my nail polish hit list – obviously, it’s turquoise – was Chanel Azure. First things first, it’s not really azure coloured (azure should be sky blue). English language pedantry aside, I honestly couldn’t care less. 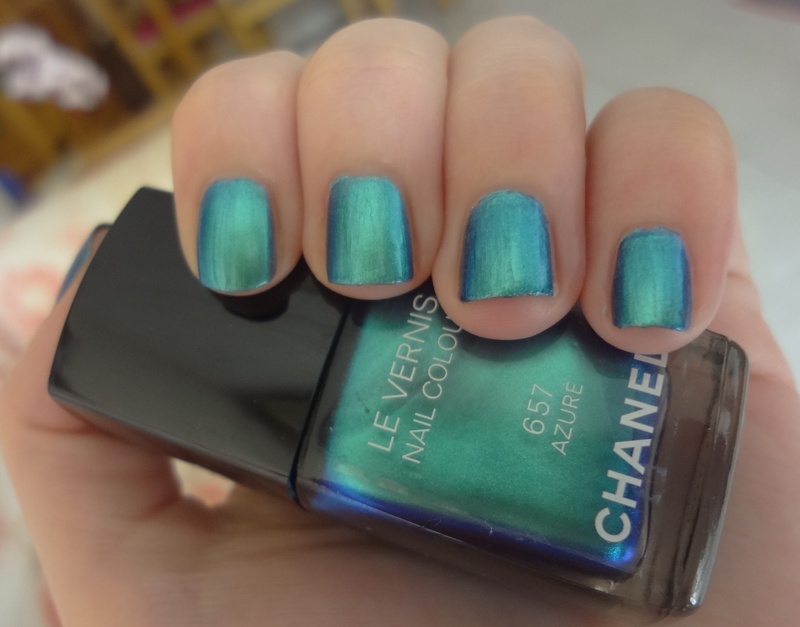 Instead, Chanel’s Azure is a glowing duochrome metallic teal beauty. It’s the magical turquoise ocean from overly Photoshopped holiday brochures, the fantasy sparkling lagoon of a Disney movie. Needless to say, it’s amazing. Fittingly for a collection named after butterflies, Azure showcases the most gorgeous iridescent flash to its turquoise shimmer – like a colourful butterfly wing caught dancing away in a tropical rainforest. 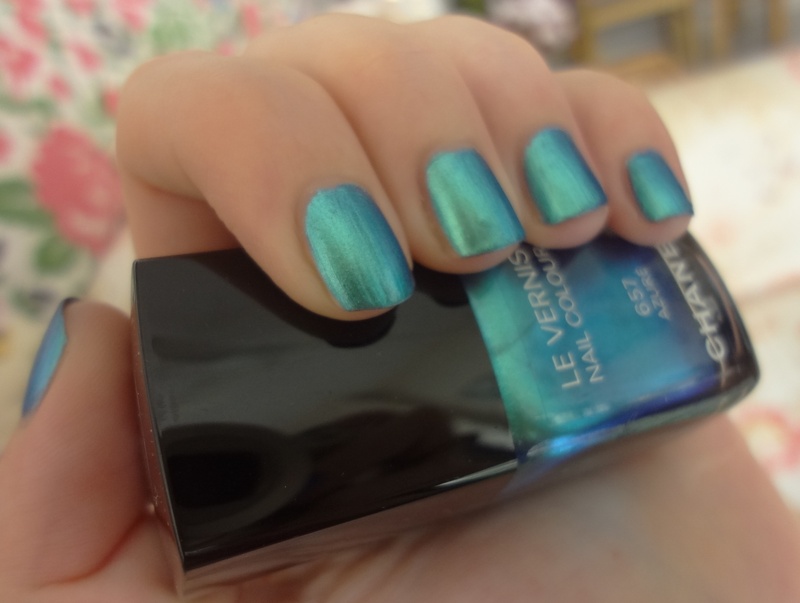 Its edges gleam a stunning cyan/cerulean blue, whilst the whole polish itself really is brilliant – in that it genuinely does seem to glow. My God, it’s gorgeous. However many picture I upload of this will never be enough! Formula-wise, Azure has a pretty thin consistency but is easy to work with, flowing nicely onto the nail. A few other reviews have commented on the brushstrokey-ness (yes, technical term) of the polish, but personally, I didn’t see anything too horrifying and it dried evenly enough for my liking. Then again, I could just be blinded by sheer turquoise love. 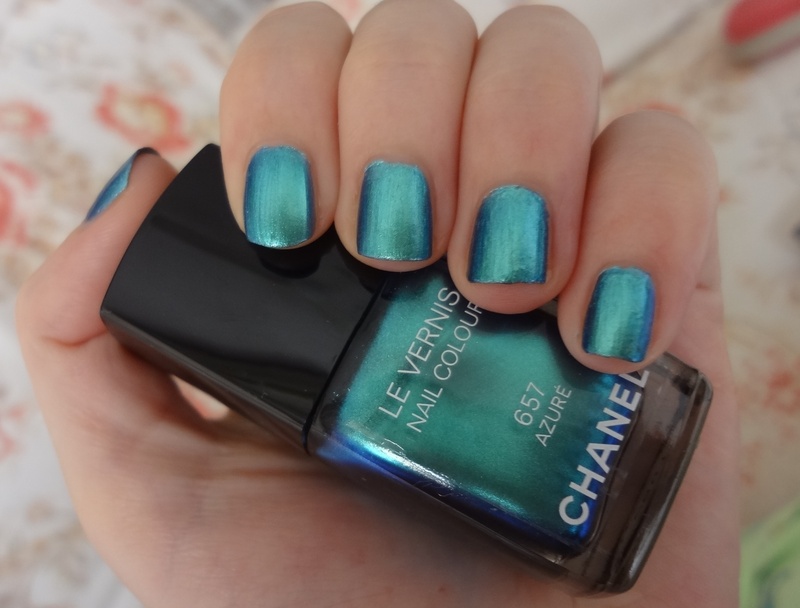 The way that metallic duochrome nail lacquers have hit the polish world over the last few years, I am sure you could find something similar to Chanel Azure for half the price. But then… it just wouldn’t be a Chanel would it?! 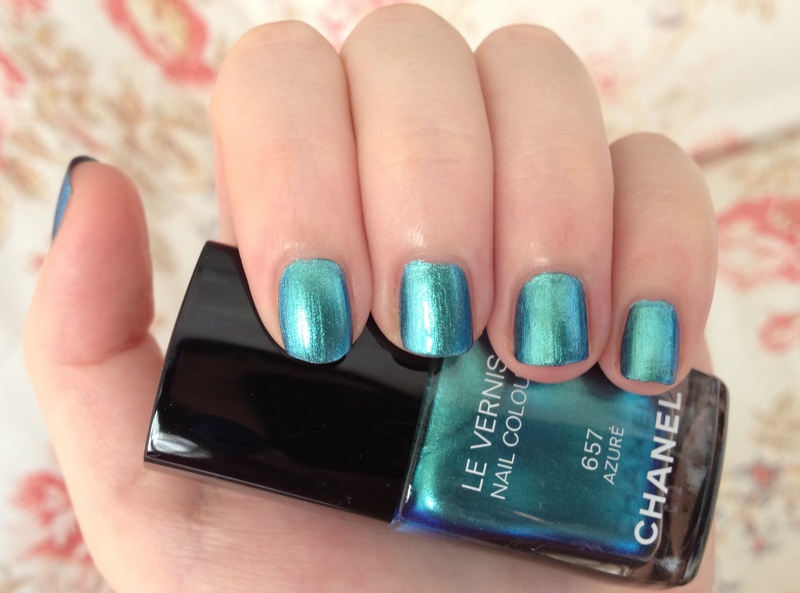 For me, Chanel polishes just feel that little bit more special, that extra ounce more magical… and for that reason, Azure HAS to be one of my favourite nail polishes of 2013. Any polish that makes me gasp every time I look at it has to be a winner, right?! 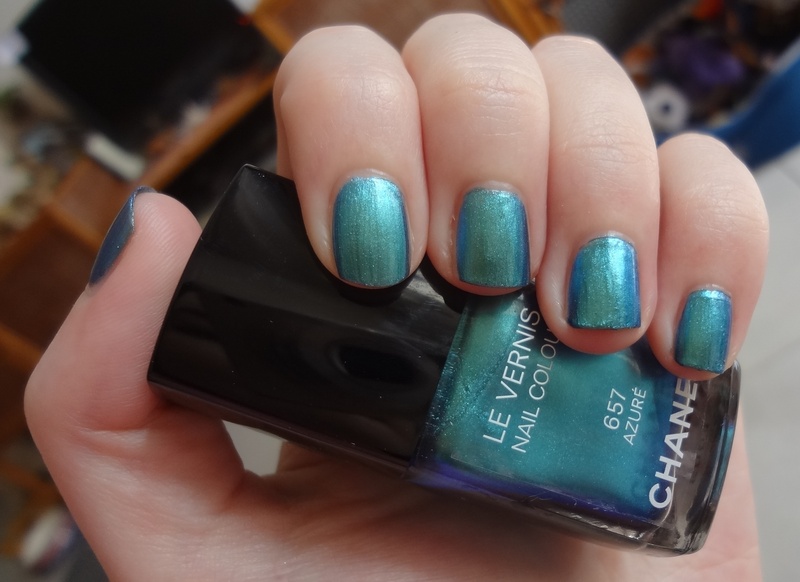 This entry was posted in Beauty and tagged Azure, Beauty, Chanel, Chanel Azure Le Vernis, cosmetics, duochrome, L'Ete Papillon de Chanel, make-up, metallic, nail lacquer, nail polish, nail varnish, photos, review, Summer 2013, swatch, turquoise. Bookmark the permalink. 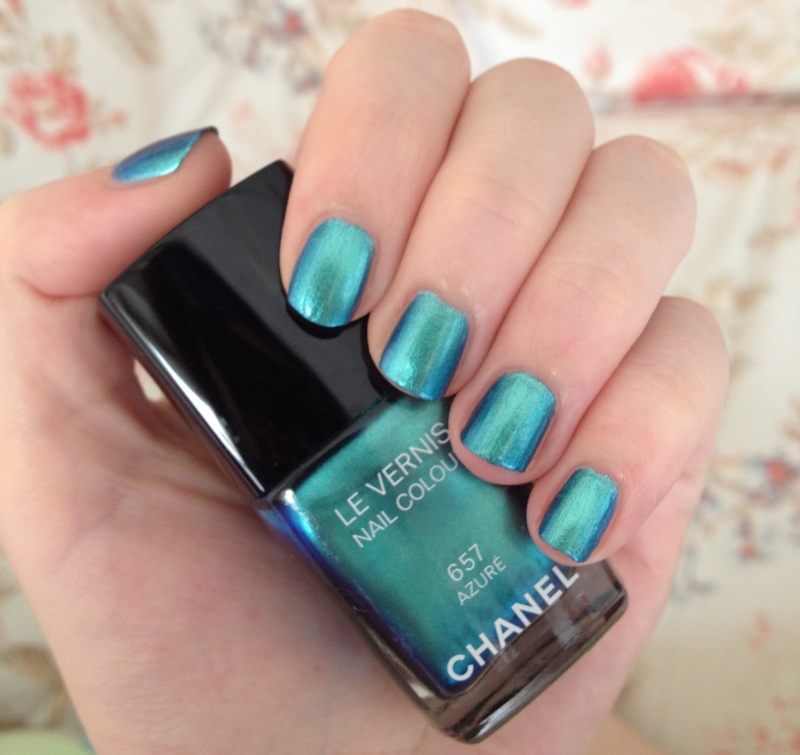 Wow – it is a brilliant shade…I want to get a bottle of this now! Thank you! Will be busting it out again this summer for sure!